Puppis constellation is located in the southern hemisphere. It represents the stern of a ship. Puppis used to be part of the much larger constellation Argo Navis, which represented the ship on which Jason and the Argonauts sailed to get the Golden Fleece, before the constellation was divided into several smaller ones: Carina (the keel), Vela (the sails) and Puppis (the stern). Argo Navis was first catalogued by the astronomer Ptolemy in the 2nd century. It was divided into the smaller constellations by Nicolas Louis de Lacaille in 1752. Puppis is a relatively large constellation which contains many notable deep sky features, including three Messier objects – the open clusters M46, M47 and M93 – and the planetary nebulae NGC 2438, NGC 2440 and NGC 2467 (the Skull and Crossbones Nebula). 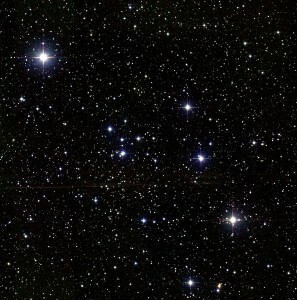 Puppis is the 20th constellation in size, occupying an area of 673 square degrees. It lies in the second quadrant of the southern hemisphere (SQ2) and can be seen at latitudes between +40° and -90°. The neighboring constellations are Carina, Canis Major, Columba, Hydra, Monoceros, Pictor, Pyxis and Vela. Puppis belongs to the Heavenly Waters family of constellations, along with Carina, Columba, Delphinus, Equuleus, Eridanus, Piscis Austrinus, Pyxis, and Vela. Puppis contains three Messier objects – Messier 46 (M46, NGC 2437), Messier 47 (M47, NGC 2422) and Messier 93 (M93, NGC 2447) – and has six stars with confirmed planets. 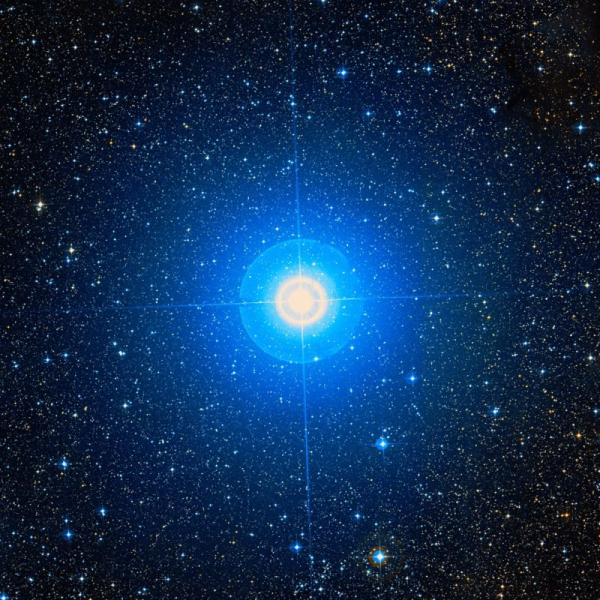 The brightest star in the constellation is Naos, Zeta Puppis, with an apparent magnitude of 2.21. There are three meteor showers associated with the constellation: the Pi Puppids, the Zeta Puppids and the Puppid-Velids. Puppis is one of the three constellations that used to form the Greek constellation Argo Navis, which represented the ship on which Jason and the Argonauts sailed to get the Golden Fleece. The French astronomer Nicolas Louis de Lacaille divided the Argo Navis constellation into the three smaller ones – Carina, Puppis and Vela – in the 18th century. Puppis is the largest of the three. Neither Puppis nor Vela have stars designated Alpha and Beta, as these stars were allocated to Carina constellation. 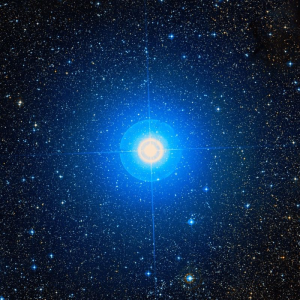 Zeta Puppis is the brightest star in the constellation. It has the stellar classification O4If, which means that it is an exceptionally hot blue supergiant star. It is one of the few O-class stars that can be seen without binoculars. It has an apparent magnitude of 2.21 and is approximately 1,090 light years distant from the solar system. It is the 62nd brightest star in the sky. Zeta Puppis has a surface temperature of 42,000 K and a mass 22.5 times that of the Sun. It has a radius about 14 times solar and is 550,000 times more luminous than the Sun. The star’s stellar wind has a velocity of 2,500 km/s and, as a result, the star sheds over a millionth of its mass every year. This is about 10 million times more than the Sun sheds over the same period. Pi Puppis is the second brightest star in the constellation. It has an apparent magnitude of 2.733 and is approximately 810 light years distant from Earth. It is a double star that consists of an orange supergiant belonging to the stellar class K3 Ib and a companion with an apparent magnitude 6.86. The supergiant has a radius about 290 times solar. It is classified as a semi-regular variable star, and exhibits variations in brightness from magnitude 2.70 to 2.85. 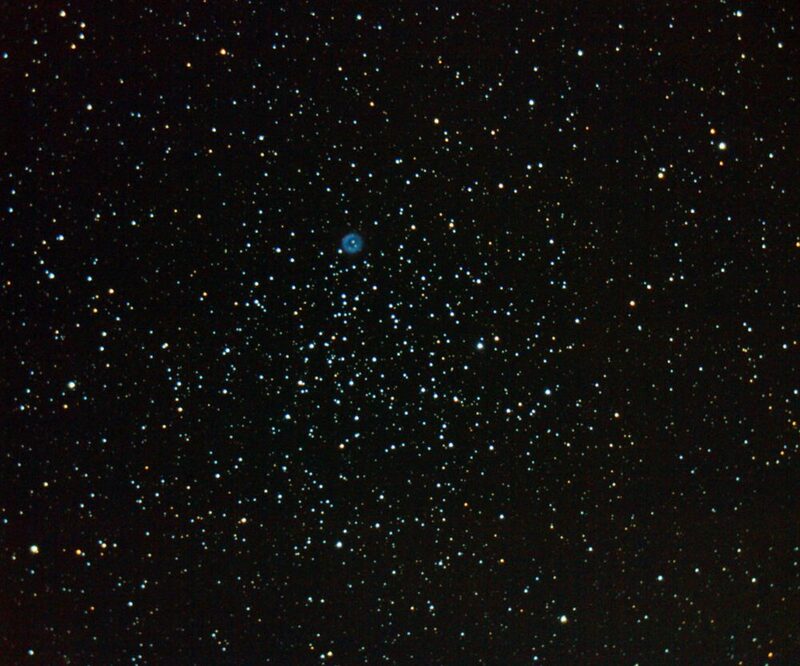 Pi Puppis is the brightest member of the open cluster Collinder 135. Rho Puppis is a yellow-white bright giant with the stellar classification F2mF5IIp. It has a visual magnitude of 2.78 and is approximately 63.5 light years distant from the Sun. It is the third brightest star in Puppis. The star is classified as a Delta Scuti type variable. Its brightness varies with an amplitude of 0.15 over a period of 0.14088143 days as a result of the star undergoing periodic pulsations. Rho Puppis is believed to be about 2 billion years old. It has a mass 1.85 times that of the Sun and a radius 3.41 times solar. It is 22 times more luminous than the Sun. The star exhibits an excess infrared emission, which indicates a presence of a circumstellar dust disk orbiting it. Tau Puppis is a spectroscopic binary star system with an apparent magnitude of 2.95. It is about 182 light years distant from Earth. The primary component is an orange giant of the stellar type K1 III. It has a radius about 27 times that of the Sun. The two stars orbit each other with a period of 1,066.0 days, or 2.9 years. Nu Puppis is a blue-white giant star belonging to the stellar class B8III SB. It has a visual magnitude of 3.17 and is approximately 43 light years distant. It is 1,340 times more luminous than the Sun. Sigma Puppis is another spectroscopic binary star in Puppis. It has an apparent magnitude of 3.25 and is about 194 light years distant from the Sun. The two stars in the system have an orbital period of 257.8 days. The system is classified as a Beta Lyrae type variable with a period of 130.5 days, which is to say it is a close eclipsing binary system that exhibits variations in brightness as a result of one component periodically passing in front of the other and blocking its light. The system has the stellar classification of K5 III, matching the spectrum of an orange giant. Xi Puppis is a yellow supergiant with the stellar classification of G6 Iab-Ib. It has an apparent magnitude of 3.35 and is approximately 1,200 light years distant from the solar system. The star has a 13th magnitude companion. c Puppis is an orange giant with the stellar classification K4III. It has a visual magnitude of 3.64 and is approximately 1,085 light years distant from Earth. The star is a member of the open cluster NGC 2451. HD 64440 is a multiple star system with an apparent magnitude of 3.72. It has the stellar classification of K1.5II+ and is approximately 352 light years distant. 3 Puppis is a binary star with a visual magnitude of 3.93. It has the stellar classification of A3Iab, matching the spectrum of a white supergiant. The star is surrounded by circumstellar gas, which is unusual for a star of this type. The system is about 2,280 light years distant from the Sun. HD 64760 is a blue supergiant with the stellar classification of B0.5Ib. It has an apparent magnitude of 4.23 and is approximately 1,650 light years distant from the solar system. Omicron Puppis is a multiple star system in Puppis. It has a visual magnitude of 4.40 and is about 2,470 light years distant from Earth. The primary component is another blue supergiant. NS Puppis is an orange supergiant with the stellar classification K3Ib. It has an apparent magnitude of 4.44 and is approximately 1,874 light years distant. L2 Puppis is a red giant belonging to the stellar class M5IIIe. It is classified as a semi-regular pulsating variable and exhibits variations in brightness ranging from magnitude 2.60 to 6.00 with a period of 140.83 days. It has a visual 10th magnitude companion located an arc minute away. The star is approximately 200 light years distant from the Sun. V Puppis is a multiple star system in Puppis. It has a visual magnitude of 4.45 and is approximately 1,165 light years distant. At the centre of the system, there is a binary star composed of a B1 class blue-white dwarf orbiting a blue-white class B3 subgiant star. The stars have an orbital period of 1.45 days. The system moves back and forth, which suggests that a massive object, likely a black hole, is orbiting it. HD 60532 is a yellow-white star halfway between the main sequence and subgiant evolutionary stage. It has an apparent magnitude of 4.450 and is about 83.8 light years distant from the Sun. It has 1.44 times the Sun’s mass and 2.52 times the solar radius. It is 8.596 times more luminous than the Sun. Two planets were discovered orbiting the star in September 2008. The inner planet has 3.15 Jupiter masses and an orbital period of 201.83 days, and the outer one has 7.46 times Jupiter’s mass and completes an orbit around the star every 607.06 days. QW Puppis has the stellar classification F3VFe-1.0 and is about 70 light years distant from the solar system. It has an apparent magnitude of 4.50. The star is classified as a Gamma Doradus type variable, which means that it is a young variable star that exhibits variations in luminosity as a result of non-radial pulsations of its surface. NV Puppis is a blue-white main sequence star with an apparent magnitude of 4.65. It is about 804 light years distant from the Sun. It has the stellar classification of B2V+. The star is classified as a Gamma Cassiopeiae variable. PU Puppis is a Beta Lyrae variable, a close binary star with the two components periodically blocking each other’s light as they orbit. It has the stellar classification of B8IV, matching the spectrum of a blue-white subgiant star. The system has an apparent magnitude of 4.69 and is approximately 551 light years distant from Earth. HD 68601 is a white supergiant belonging to the spectral class A7Ib. It has an apparent magnitude of 4.76 and is approximately 4,024 light years distant from the solar system. MX Puppis is a blue-white giant with the stellar classification of B1.5IIIe. It is 13,276 times more luminous than the Sun and has over 10 solar masses. It has an apparent magnitude of 4.81 and is approximately 979 light years distant from the Sun. It is classified as a Gamma Cassiopeiae variable, or a shell star, a fast rotating star that has a circumstellar disc of gas at the equator and exhibits variations in luminosity as a result of the outflow of matter. MX Puppis is a spectroscopic binary star with a period of 5.1526 days. HD 69830 is an orange dwarf belonging to the stellar class K0V. It has a visual magnitude of 5.95 and is 40.6 light years distant from Earth. It has 86 percent of the Sun’s mass, 89 percent of the solar radius, and 45 percent of the Sun’s luminosity. It is about 7 billion years old. A debris disk was discovered orbiting the star in 2005, and three extrasolar planets were confirmed to be orbiting the star in 2006. The planets have minimum masses comparable to Neptune. The innermost planet has at least 10.48 Earth masses and an orbital period of 8.667 days. The middle planet has at least 12.07 times the Earth’s mass and a period of 31.56 days. The outermost planet has 18.43 Earth masses and completes an orbit around the star every 197 days. The outermost planet is believed to be within the star’s habitable zone, where liquid water would remain stable. NGC 2423.3 is a red giant star with the stellar classification of K-M III. It has an apparent magnitude of 9.45 and is approximately 2,498 light years distant from Earth. The star is a member of the NGC 2423 open cluster. It has a mass 2.4 times that of the Sun. A planet with a mass at least 10.6 times that of Jupiter orbits the star every 714.3 days (1.956 years). It may be a brown dwarf instead, but this has not been confirmed as only the minimum mass is known. The planet was discovered in July 2007. 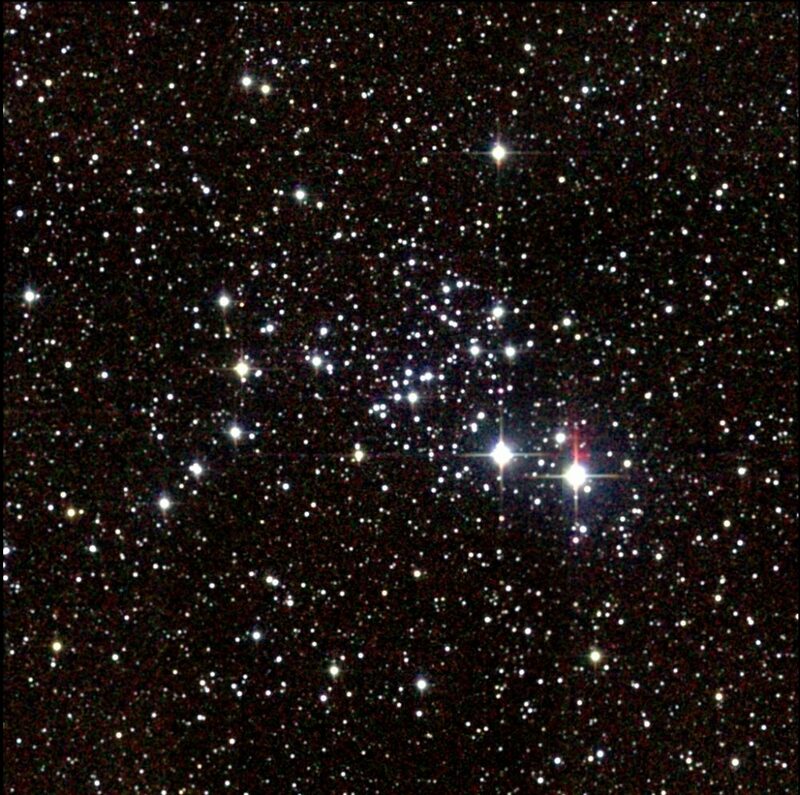 Messier 46 is an open cluster with an apparent magnitude of 6.1. It is approximately 5,500 light years distant from Earth. The cluster was discovered by Charles Messier in 1771. It is believed to be about 300 million years old. The cluster appears to contain the planetary nebula NGC 2438, but the two are probably unrelated and merely lie along the same line of sight. 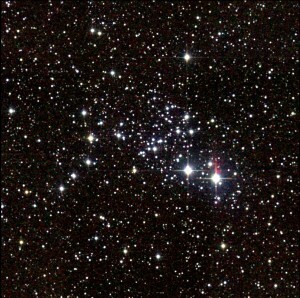 Messier 47 is another open cluster in Puppis, about a degree west of Messier 46. It contains about 50 stars, the brightest of which is of magnitude 5.7. Messier 47 – Two Micron All Sky Survey (2MASS), a joint project of the University of Massachusetts and the Infrared Processing and Analysis Center/California Institute of Technology, funded by the National Aeronautics and Space Administration and the National Science Foundation. The cluster was discovered by the Italian astronomer Giovanni Batista Hodierna around 1654 and later independently discovered by Charles Messier on February 19, 1771. Even though Messier specified the coordinates for the cluster with respect to the star 2 Puppis, there is no cluster in the position that he indicated. The position, however, might match that of NGC 2422. M47 has an apparent magnitude of 4.2 and is approximately 1,600 light years distant from the Sun. It is believed to be about 78 million years old. Messier 93 is an open cluster in Puppis. It has an apparent magnitude of 6.0 and is approximately 3,600 light years distant from Earth. Messier 93 – Two Micron All Sky Survey (2MASS), a joint project of the University of Massachusetts and the Infrared Processing and Analysis Center/California Institute of Technology, funded by the National Aeronautics and Space Administration and the National Science Foundation. The cluster was discovered by Charles Messier in 1782 and subsequently included in Messier’s catalogue. M93 is about 10 light years in radius and believed to be about 100 million years old. NGC 2451 is an open cluster. It was discovered by Giovanni Batista Hodierna in 1654. The cluster is in fact two clusters, one at a distance of 197 parsecs and the other at a distance of 358 parsecs. The clusters are labelled NGC 2451 A and NGC 2451 B. NGC 2451 has a visual magnitude of 2.8 and is 850 light years distant. It consists of about 40 stars. The brightest one, c Puppis, is a magnitude 3.6 yellow giant. NGC 2477 is an open cluster located near NGC 2451. It has an apparent magnitude of 5.8 and is about 3,600 light years distant from the Sun. It contains about 300 stars and is believed to be about 700 million years old. The cluster was discovered by Nicolas Louis de Lacaille in 1751. It is often called “one of the top open clusters in the sky.” It can be found 2.5 degrees to the northwest of the bright star Zeta Puppis. The brightest star in the cluster has a visual magnitude of 9.81 and belongs to the spectral class B8. Collinder 135 is an open cluster that consists of four stars that are visible to the naked eye. The main star in the cluster, Pi Puppis, is a bright orange supergiant, and the 5th magnitude stars are classified as variables: NV Puppis is a Gamma Cassiopeiae type variable and NW Puppis is a Beta Cephei variable. The cluster has an apparent magnitude of 2.1 and is approximately 840 light years distant. 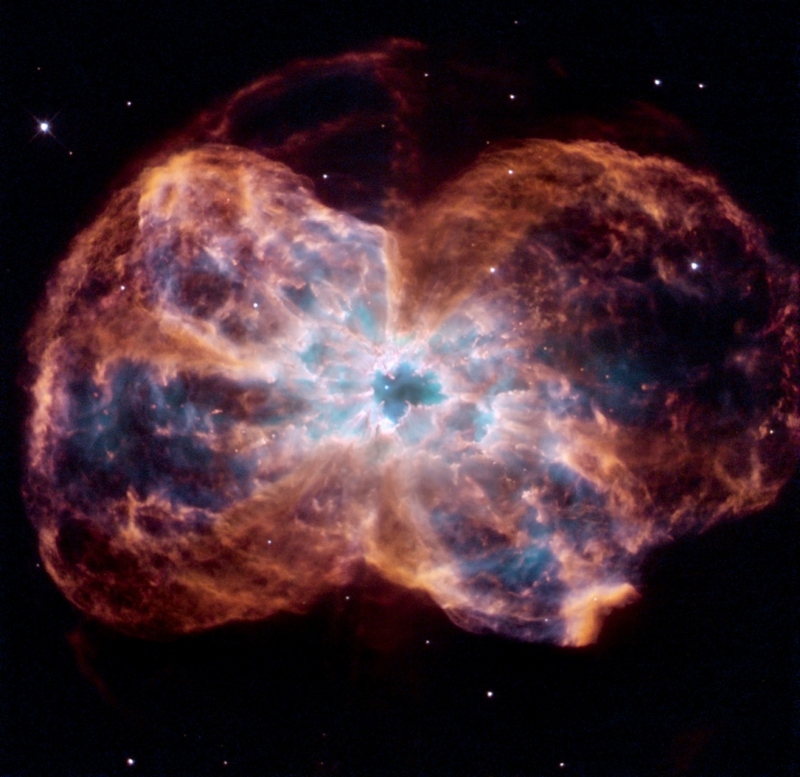 NGC 2438 is a planetary nebula in Puppis. It has a visual magnitude of 10.8 and is approximately 2,900 light years distant. It has an extended halo and the central star is a white dwarf with a visual magnitude of 17.7. The dwarf is one of the hottest stars known, with a surface temperature of 74,700 degrees Celsius (75,000 K). The nebula was discovered by the German-born British astronomer William Herschel on March 19, 1786. It appears superimposed on the cluster Messier 46, but the two objects are most likely unrelated as they do not share a common radial velocity. NGC 2467 is a star-forming region in Puppis constellation. It is occasionally mentioned as an open cluster, but is not in itself a distinct open cluster, but consists of several groups of stars superimposed on one another along the same line of sight. The dominant star in the region is HD 64315, a massive young blue star belonging to the stellar class O6. The H II region of the nebula has been a popular target among scientists studying the process of star formation. NGC 2509 is another open cluster in Puppis. It has an apparent magnitude of 9.3. NGC 2439 is an open cluster in Puppis. It is approximately 12,570 light years distant from Earth and has an apparent magnitude of 6.9. It is 10 arc seconds in size and can be seen with a small telescope. The cluster is believed to be about 10 million years old. NGC 2440 is a planetary nebula in Puppis. It has an apparent magnitude of 9.4 and is approximately 4,000 light years distant from Earth. The central star in the nebula, HD 62166, is possibly the hottest white dwarf known. It has a surface temperature of 200,000 kelvins and is 1,100 times more luminous than the Sun. It has 0.6 times the mass of the Sun and only 0.028 times the solar radius. The star has an apparent magnitude of 17.5. The nebula was discovered by William Herschel on March 4, 1790. The nebula was notably footnoted in the Battlestar Galactica series, in episode “Crossroads: Part II,” as one of the major markers on the way to Earth. 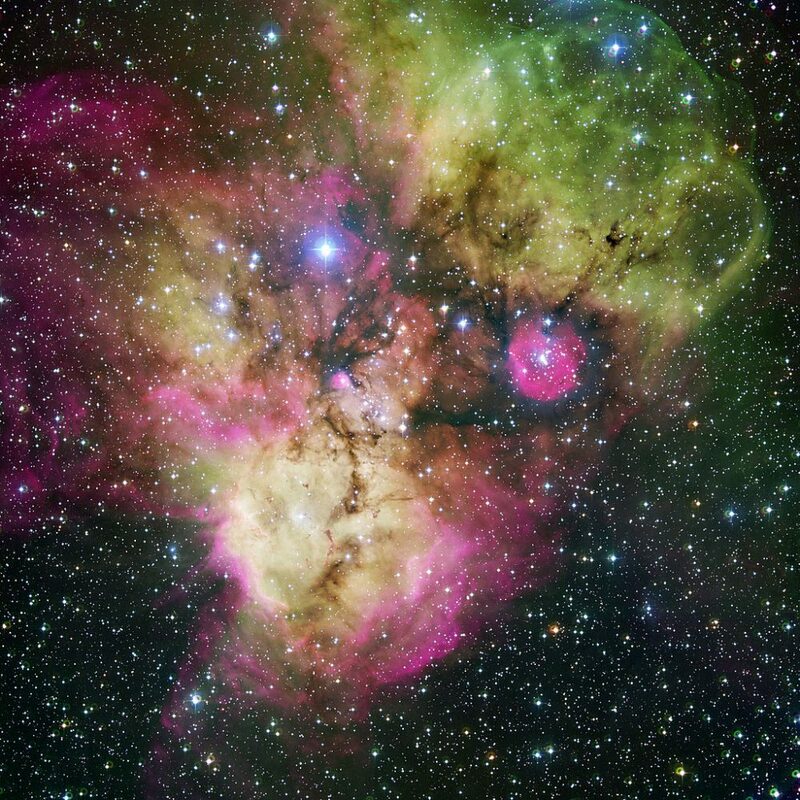 The Ionian Nebula seen in the episode, which is a supernova remnant and not a planetary nebula, both resembles NGC 2440 and is located 4,000 light years from Earth. NGC 2298 is a globular cluster with an apparent magnitude of 9.3. It was discovered by the Scottish astronomer James Dunlop on May 8, 1826. It is approximately 30,000 light years distant from the solar system. NGC 2546 is another open cluster in Puppis. It was discovered by Lacaille in 1751-1752. The cluster has an apparent magnitude of 6.3 and is approximately 3,300 light years distant.